Welcome back to the last post in this Lost and the Damned tactica series. I know it has taken ages (over a year!) to finally complete it but we are here now and I think we have covered everything. Last up, but certainly not least, are the Slaaneshi Daemon Engines. 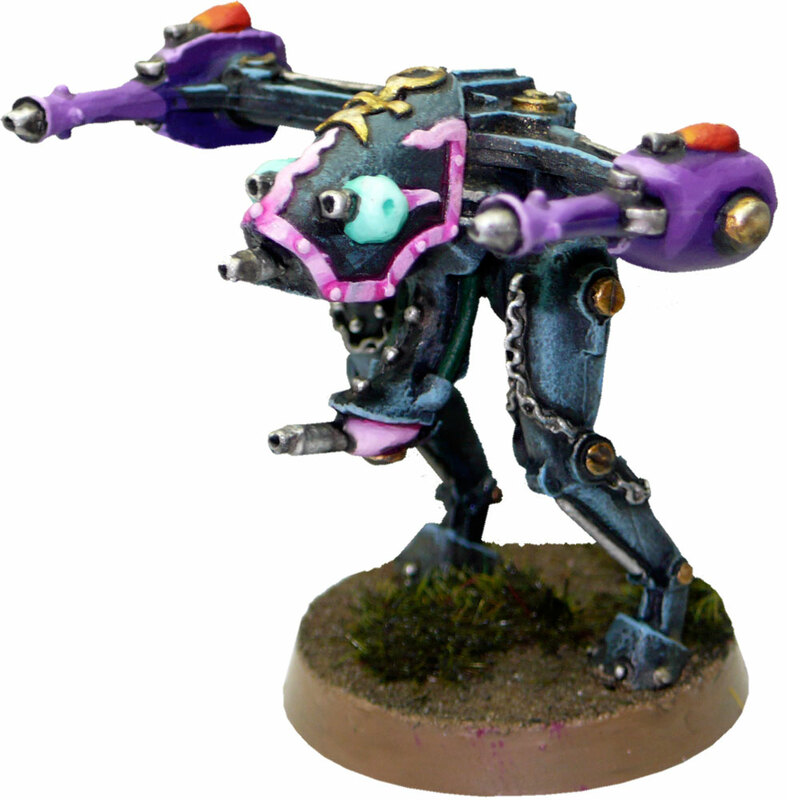 Fast, lithe, and generally rather fragile, Slaaneshi units in EPIC mirror their 40k cousins. Oddly, Slaaneshi aligned units in EPIC do not have a clear bias towards either shooting or close combat, with each unit, although specialised towards one or the other, offering a broad god-aligned choice. This balancing is much more noticeable than with Khorne (close combat), Tzeentch (shooting), or even Nurgle, who is generally considered the other all-rounder god. 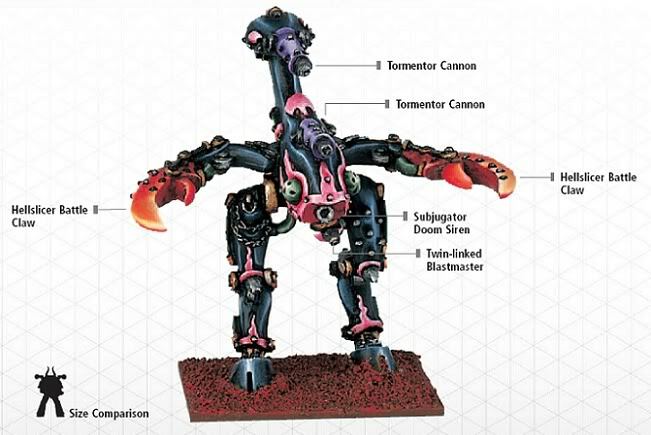 Slaanesh has three aligned units in the Lost and the Damned list – the smaller Daemon Knights and the two larger, warhound titan sized, Questor and Subjugator titans. Daemon Knights: Daemon Knights are a fast, shooty, armoured walker which gives the Lost and the Damned army some much needed speed and quality firepower. Moving 30cm, with a 4+ armour save, and a 4+ firefight score makes them excellent for initiating supporting fire and engagements, especially in combination with their Invulnerable Save special rule. 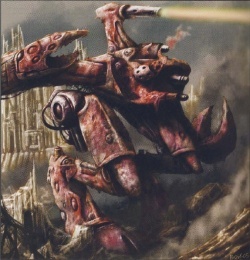 In addition to this, each Knight is armed with a Castigator Cannon (45cm, 3x AP3+/AT5+) which gives them some serious firepower – being longer range than most of the rest of the Lost and the Damned army and being of a higher quality. Given that they come in a formation of four for 275pts, twelve AP3+ shots is a very good output and can be especially nasty if their speed is used to claim cross-fire. All of this is topped off with two very important special rules – Fearless and Scout. Being Fearless means that the Knights are likely to stick around for alot longer than otherwise, and that they can use any withdrawal moves to set up advantageous rally positions. Scout helps to screen some of the bigger, more unwieldy LatD formations, while also meaning these things can garrison in deployment. This puts them right up in the face of the enemy, which is good because it allows them to play a part in the battle almost instantly, but can see them attracting ALOT of firepower early on, so try and use cover (walker remember!) to keep them hidden. Titans: Just a quick look at the stats both share before moving onto their particularities. Both titans are warhound equivalents, being 3 DC war engines with 2 void shields. Both move 35cm and both have a 5+ Reinforced Armour save. Both have the special rules Fearless and Walker. They both come in a freely mixed formation of 1 – 2 at 225pts for a Subjugator and 275pts for a Questor. 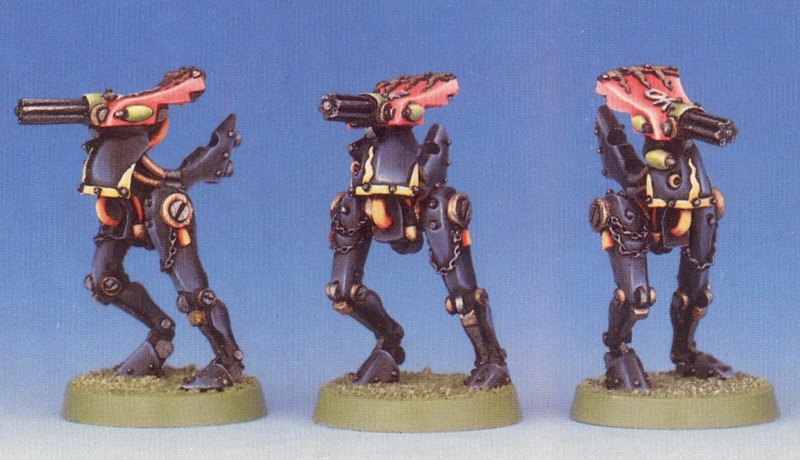 All of this makes them broadly analogous to loyalist warhounds, and they fulfil the same kind of role in the list as warhounds do in Imperial lists. Their speed and resilience make them stand out, as does the fact they are the only things in the whole list which have Void Shields. Questor: The Questor takes the warhound chassis and gears it towards shooting. Sporting two Castigator cannons (45cm, 3x AP3+/AT5+) and two battlecannons (75cm AP4+/AT4+), the Questor boasts quite abit of good quality firepower at a decent range. This makes it somethign of a standout in the context of the list, and when placed on a speedy platform eight shots can proves pretty fearsome. Still at 275pts, it is the more expensive of the pair, and when compared to the Daemon Knights above, lacks comparable firepower. The slightly longer range and slight resilience boost offsets this to some degree, but in terms of raw firepower, I feel it is a little lacking. However, with a 3+ FF and two Void Shields, the Questor can be a very efficient engagement enabler allowing for bigger formations to provide supporting fire. Subjugator: The Subjugator takes the opposite direction, gearing itself almost entirely for close combat. Although it does mount a single battle cannon (75cm AP4+/AT4+), the real weapons are the pair of Hellblades it carries. Each provides two extra attacks in close combat which are TK(D3), meaning that each titan is attacking with 4 TK(D3) and 3 regular attacks all of which hit on a 3+. On a lucky day that means that a single Subjugator could eat an Emperor titan – certainly something to be scared of for only 225pts! However, the major downside of the Subjugator is that it appears in an army with a strategy rating of only 2. This means it is highly likely that the Subjugator will be destroyed before being able to engage its target. Although this can be offset by having lots of them, or having lots of bubble-wrapping formations for them, the Subjugator seems to me to be much more worthwhile in lists like the Emperors Children (strategy rating 4) where at 250pts each they seem an absolute bargain. That brings us to the end of the Lost and the Damned Tactica. Please give me a shout / comment if there is anything you still want me to talk about / have not covered, or let me know which army you would like to see done in the future! Next postBFG – Ork reinforcements (1) WAAAGH! Awesome work, man! Thanks for taking the time to write these articles. I’m sure with all of the cool new stuff coming out from Onslaught, there’ll be more players looking for advice on how to play this army. Hey nice work, just saw this, will have a read through the rest of the articles. Cheers. No worries. Let me know what you think!